There are at least 11 ways to get candida from the use of antibiotics. The body normally contains at least 100 trillion bacteria that control candida growth, as well as an intact immune system and mucus cells. 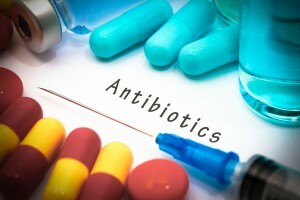 Antibiotics affect all of these areas, paving the way for easy candida overgrowth and all the problems that go with it. 1) Antibiotics eliminate the competition! Without 100 trillion bacteria present to crowd out and inhibit it, you’ll find that fungal candida grows unchecked. One of the main types of bacteria that control candida are the Lactobacillus species. Once they are gone, fungal candida grows and spreads, and will then in turn prevents the Lactobacillus species from recolonizing the intestinal tract later on. Of the 11 ways to get candida from the use of antibiotics, this is probably the most significant! 2) Taking antibiotics means that there’s more food for candida. Without 100 trillion bacteria present, the competition for nutrients ceases to exist and fungal candida has more than enough food to fuel its growth, and grow it does! 3) Antibiotics change the pH of the intestinal tract. Fungal candida requires an alkaline pH for its growth. Many of the bacteria in the intestinal tract produce acids. Antibiotics eliminate these acid-forming bacteria and this leads to pH changes that stimulate the conversion of candida from yeast to fungus. It is well established that a pH around neutrality (pH ~6·5) favours hyphal development of C. albicans in vitro, while a low pH (pH <6·5) blocks hyphal formation and stimulates growth of the yeast form. 4) Antibiotics destroy bacteria that produce antifungal compounds that control candida growth. Elimination of the Lactobacillus bacteria eliminates production of long and short-chain fatty acids that inhibit candida’s fungal conversion. 5) Antibiotics disrupt the mucosal barrier of the intestinal tract. Mucins are proteins found in mucus that suppress the fungal invasion of candida. Antibiotics break down mucins leaving people vulnerable to the growth and spread of candida throughout the body, not to mention leaky gut! 6) Antibiotics directly stimulate yeast to fungus conversion. The tetracycline antibiotics have been associated with direct stimulation of fungal candida growth. Antibiotics commonly suppress different ares of the immune system. Fungal candida can manipulate the immune system and grow unchecked throughout the body. Suppression of immune cells is a frequent, if not constant, effect of antibiotic use, especially of those cells (neutrophils) that are most effective against candida. Erythromycin and other antibiotics suppress neutrophils and macrophages, the two most effective immune cells against fungal candida. 8) Antibiotics cause an immune system shift that favors the growth of fungal candida. A Th1 immune is most effective against fungal candida, as well as viruses, parasites, and many bacterial pathogens. Antibiotics create a shift towards a Th2 immune response that allows for the spread of fungus, viruses and other infectious agents. 9) Antibiotics eliminate bacteria that regulate immune responses. The microbiome helps to maintain and regulate immune responses throughout the body. 10) Antibiotics alter other immune system responses. By suppressing the macrophages and the inflammatory response, the liver does not release acute-phase proteins which are necessary for preventing the spread of pathogenic organisms throughout the body. Three of these acute-phase proteins (Ferritin, Ceruloplasmin, & Haptoglobin) function by binding iron and making it unavailable for the growth pathogenic fungal candida. Without these immune proteins, candida has access to all of the iron that it needs to spread and grow. There are at least 3 separate iron uptake pathways in the pathogenic fungal form of candida. It comes well prepared! 11) Antibiotics create signalling proteins. By killing off over 100 trillion bacteria, antibiotics cause the breakdown of the bacterial cells and a massive release intracellular bacterial components, like Peptidoglycans (PGN) that act directly on the cellular membrane of the yeast Candida Albicans causing it to transform its normal yeast to its pathogenic fungal form. There are probably more than 11 ways to get candida from the use of antibiotics, but really, isn’t this alone enough? Get started today on Dr. McCombs Candida Plan and find out how healthy you can be!! !